Expect more of your spectator and challenge yourself to say something, not just sing anything. All performance is theatre; audiences perceive concert going experiences not only through their ears but with the rest of themselves as well. 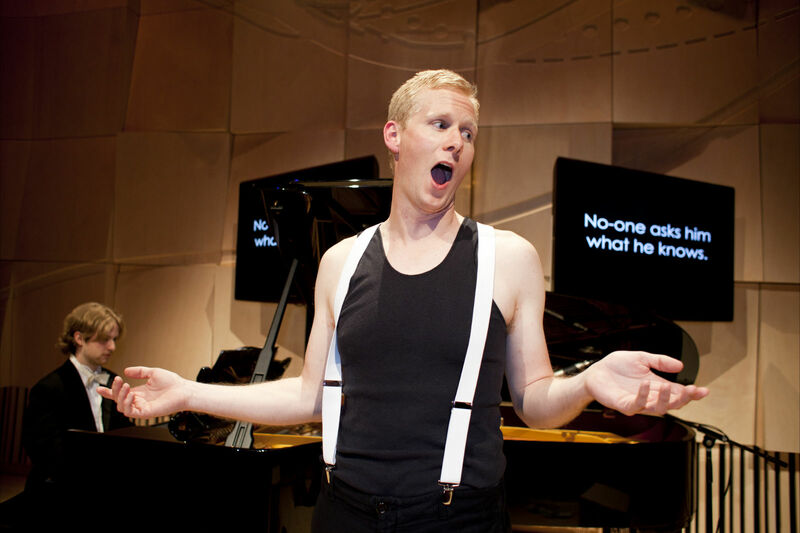 As singers, we know that there are many elements to consider when putting together a recital program but sometimes we get so wound up in challenging ourselves as singers that we fail to challenge our audiences. We work hard to be able to demonstrate mastery over certain aspects of our craft and I don’t think it’s a sin to want to show what one is capable of. However, it saddens me when I see a performer on stage doing exactly that, and nothing else. At the conclusion of an effective recital the audience will leave the hall talking animatedly about what they’ve just experienced; a conversation cannot go on for very long if all they have to say is ‘wasn’t that beautiful’ or ‘doesn’t he have wonderful technique’. Oftentimes, when a singer plans a recital, they pay acute attention to certain aspects of their complex relationship with the audience and ignore others. For instance: singers find it natural, most of the time, to consider their appearance and dramatic gestures in preparation for a recital but some singers choose the content of their programs without considering what they wish to say to their audience. As acting singers we often talk about forming a rapport with the audience by communicating text as if we were conversing with them (though we do not expect them to respond); For me, the programming, physical setting, staging, delivery, interaction between performers, costuming, lighting and even the program notes are also part of that conversation. I believe that successful art does actually illicit a response from an audience. In other words, if you want them to still be thinking about your performance in a few ‘hours, days, months-time’, you need to give them something to react to. There are many ways of getting a reaction and not all of them rely on shock tactics or audience harassment (though I’ve seen some deliciously effective examples of that). Much can be achieved by thoughtful repertoire selection and positioning, manipulating or superimposing narrative and by utilizing loaded symbols, characters and scenarios that will have strong connotations for the audience. For me, the key is to knock that passive, subject audience out of position. I want them involved, be it by force, by persuasion or by manipulation but for fucks sake lets not have another ‘what-my-teacher-wanted-me-to learn-this-semester-to-help-with-my-technical-development’ themed recital. Unless we’re happy relying on the power of a well-known major piece to do all the work for us, we need to be smarter than that. 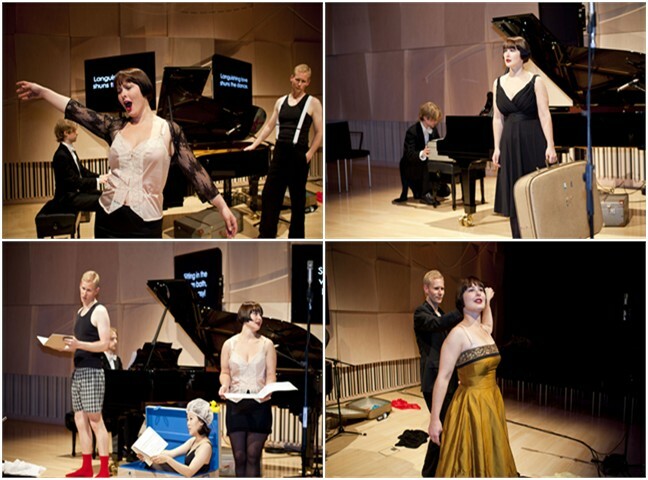 I was asked to write about the process we took in programming a particular recital entitled “Weimar Portrait” held at the Melbourne Recital Centre. The performers were from Melbourne, Australia based group called Aria Co. On this occasion the conversation we were trying to have with our audience was about Germany’s Weimar Republic and the Nazi rise to power. We had 3 singers, a pianist and a room without a raised stage that seated about 100 people. The basic idea for the recital was to take music from the Weimar era of Germany and present a portrait concert. The more I thought about it, the less satisfied I was because I realized that we couldn’t render a successful image of the Weimar era without contrasting it against what followed. So we decided to expand our repertoire choices into war-time music. From 1919 until 1931 Germany was known as the Weimar Republic . It was a time of much uncertainty, political tumult, a swirling rush of multiculturalism and changing social attitudes. This was all going on alongside the Nazi rise to power and ended when the Nazi party were democratically elected by the German people in 1931; the horrors that followed are well documented. Most audiences, especially the standard crowd at a classical music event, will have strong memories when confronted with material from WWII. Those memories and connotations provide excellent fuel for getting that much desired ‘reaction’ out of an audience. In a situation such as this, choices of repertoire and the ordering and presentation of that repertoire can effectively contribute to presenting not only historical facts and narrative but a subjective reading. One must understand the material well, decide upon your position and be prepared to defend it. The texts we chose came from disparate political and social climes, from Goethe and Holderlin to Brecht and his contemporaries. The music was written by composers who lived in Germany during the Weimar period and through the Nazi rise to power. Though each composer was affected differently, all of their lives were completely altered by the path of politics; first by the growing experimentalism of the Weimar era and second by the blunt force of Nazi ideology. Each composer’s fate rested with who their parents had been and who they decided to become amidst all this tumult. Now, to how we decided our ‘position’ and how we layered our ‘reading’ atop the music…. Though the personal circumstances of each composer were different, I realized that there were compelling unifying elements between them, not least that all of these men were Germans. They mostly identified as such above religion and politics, yet for most of them, their homeland rejected and persecuted them. For example: I was moved by how similar the music of Pfitzner and Ullman sounded. For this reason I decided to arrange the program so as to highlight the similarities between them. They both chose to set the words of the great German romantic poet Holderlin; both wrote in a relatively traditional Lieder style and both were influenced by the music of Wagner and Mahler. In life, Pfitzner was the most anti-semitic composer represented on this program and Ullman was murdered in a concentration camp. On another front, we wanted to honour the theatrical conventions of the time through our dramaturgy. Berthold Brecht wrote many of the texts heard in the concert and we drew inspiration from his ideas. We aimed to create the ‘defamiliarization effect’ that Brecht so highly valued, by employing a few of his theatrical devices. The aim being, that just as in Brecht’s Epic Theatre, the audience would be at all times aware of themselves ‘being audience’ and discouraged from becoming passively swept up, as in a traditional narrative. We hoped that such a situation would provoke active thinking from our audience; the rationale being that the more aware one is of one’s role in a situation the less passive one is able to be. We used brighter than usual unchanging stage light throughout the show. We used surtitles for all the poetry. We created scenarios and characters specifically for each song (even for songs not originally part of any dramatic context). Using the surtitle monitors we announced any extra pieces of information we wished (rather than using sets, we sometimes ‘changed locations’ by announcing a ‘location’ on the monitors). We made all costume changes on stage in plain view of the audience. We transitioned between characters on stage. We swapped ‘roles’ (for example, our pianist packed up at one stage and a singer sat down at the piano). We contrasted naturalistic costumes and props with non-naturalistic ones and inserted moments of absurdity into otherwise naturally played out narratives. The program notes (WEIMAR PORTRAIT – PAINTING IN SONG) are linked and performance photos are displayed throughout the post if you’d like to see examples of how any of this worked. A week after the show, I found myself in conversation with some people who had been to see it. We had a lengthy discussion, where they asked lots of questions, shared their opinions on the music and we talked about the contemporary political relevance of the subject matter; it was clear to me that the recital was still on their minds. I thought that was very exciting. Jessica Aszodi is a graduate of the Victorian College of the Arts, Australia. 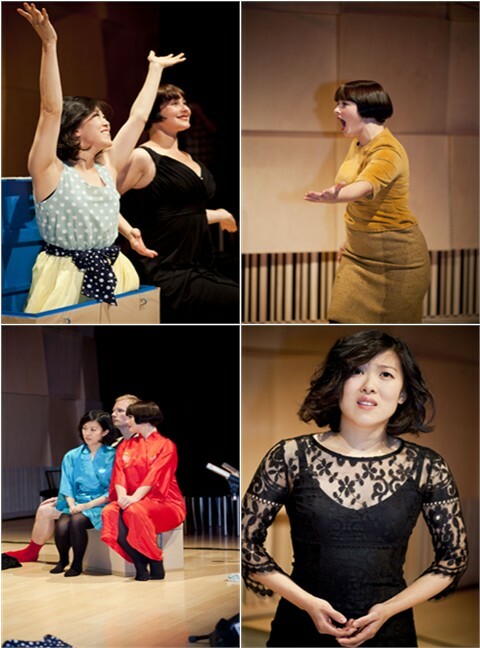 She is an alumna of the Victorian Opera Company’s young artist program and has appeared with them many times as a principal artist. Her practice encompasses experimental, conventional and contemporary classical repertoire. 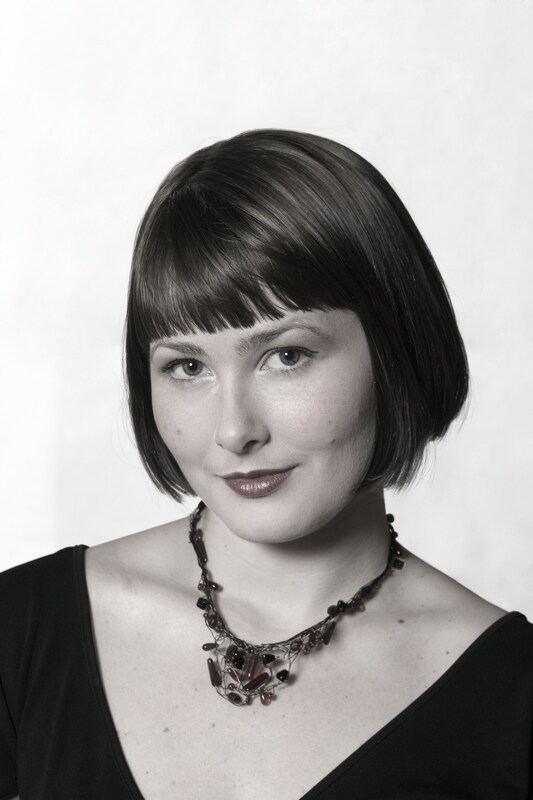 Jessica has sung over a dozen roles with Australian and international opera companies including Elvira (Don Giovanni), Eve (Dienstag aus licht), Aminta (The Shepherd king) and Sesto (Guilio Cesare) for which she was nominated for a Greenroom award. She has been a soloist with the Melbourne Symphony Orchestra, the Melbourne Chorale, Astra Chamber music society, the Song Company, Royal Melbourne Philharmonic Orchestra, at the Macau International Music Festival and at many Australian Arts festivals. Terrific post. I wish that young singers, including high school and college students, would see the possibilities of designing recitals that are more than just voice studio portfolios. You make a great case for engaging the audience. Brava. I agree wholeheartedly! Thanks for commenting on the blog.